China is the world's biggest consumer and producer of coal. Mongolia is on China's border to its north. Mongolia is on the verge of significantly increasing its coal production to over 40 million metric tonnes of coal per year. This will be a quadrupling of coal production from 2008 levels. Source: ACI Mongolia, The Financial Markets Association, Mongolia Growth Group November 2011 presentation. 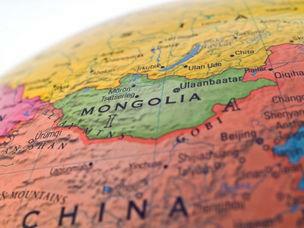 This year, Mongolia surpassed Australia as the biggest exporter of coking coal to China. 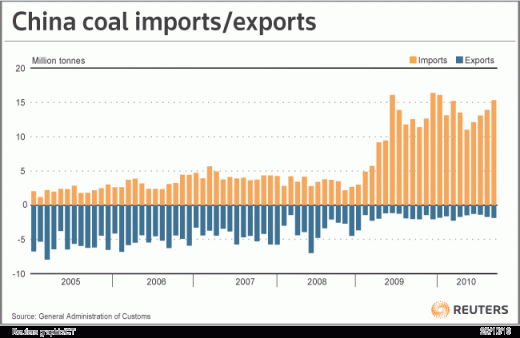 But, China does not import that much of its coal yet. China began to export coal in 1981, and only became a net importer of coal in 2009. 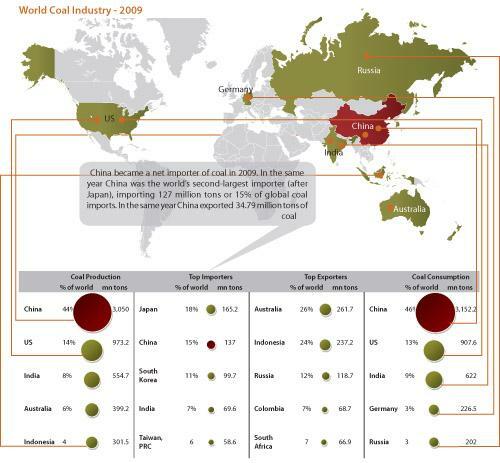 Source: Understanding The Chinese Coal Industry; The Beijing Axis Analysis; The China Analyst. 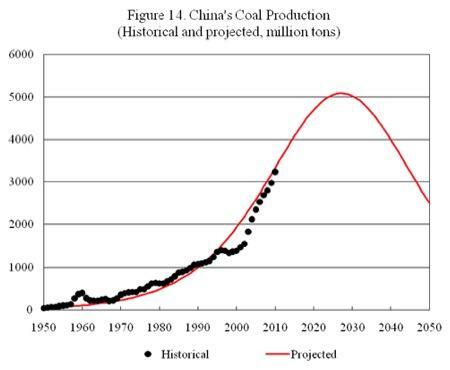 Some analysis has also suggested that coal production in China may have reached its peak. Indeed, "Even if China's annual coal demand growth halved to 5% then the country would run out of coal in 21 years unless it finds material new deposits," according to a David Winning Wall Street Journal article citing a local brokerage. The same article offered as a counterpoint that according to the International Energy Agency, "Annual consumption growth of 5% would see China run out of coal in 28 years." 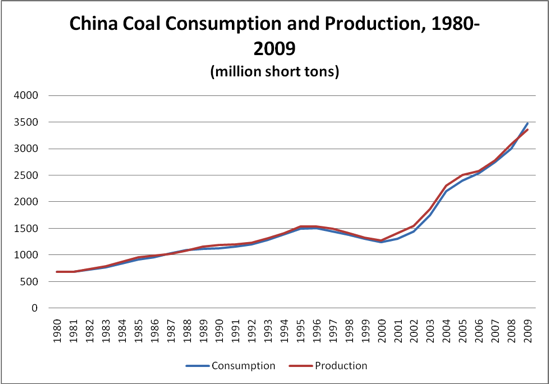 However, growth of coal production and consumption in China has been over 5%. Source: Institute for Energy Research; U.S. Energy Information Administration. And, as David Fessler has pointed out in an article about Indonesian coal producer PT Bumi Resources, global coal consumption, as well as Chinese coal consumption, is expected to continue to rise. Source: David Fessler; U.S. Energy Information Administration. 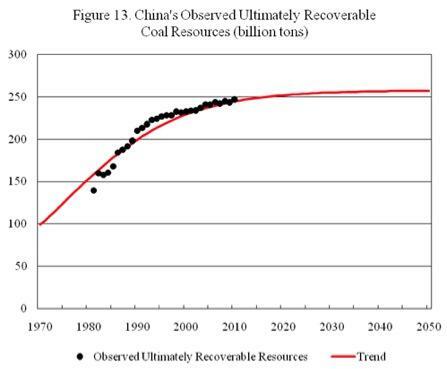 Multiple sources agree that China's ability to recover more sovereign coal is trailing off. Source of two figures above: Peak Energy And The Limits To Global Economic Growth, Annual Report 2011, by Dr. Minqi Li, Univeristy Of Utah (Dr. Li, a Chinese political prisoner from 1990 to 1992 received his Ph.D. in Economics in 2002 at University of Massachusetts). These figures can be found on page 43 and 44 of his report. 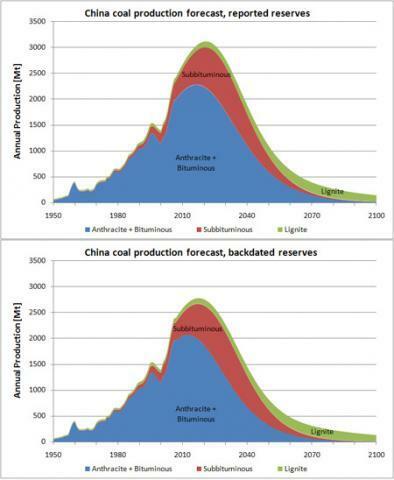 This is a lot of data from different sources, explaining that China will have an increasing demand to import coal. Source: Jude Clemente's Energy Blog, Reuters. 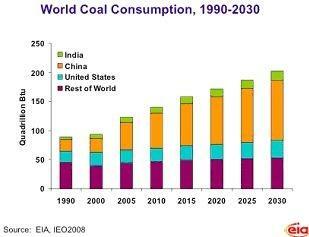 China needs well over 3,000,000,000 tonnes of coal per year, and that number is still growing. The country still produces most of the coal it consumes, but it has begun relying on imported coal to meet its demands. Mongolia is expected to have a mining boom that will produce over 40,000,000 tonnes of coal per year by the second half of this decade. Without considering other export opportunities, it seems likely that China's coal demand could easily absorb all of Mongolia's peak annual coal production for years to come. China's consumption is higher, but low-balling and assuming consumption declines a bit, this number is a fair baseline. Looking at these two numbers, China could consume all of Mongolia's coal production 75 times over if Mongolia used none of its coal for itself and China ceased producing coal. So, if China has a shortfall in coal production vs. coal consumption that is 1/75 of their consumption needs, they can look north to neighboring Mongolia to fill that need. 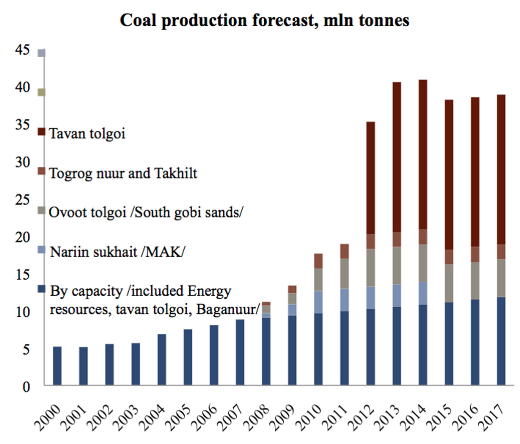 There are other estimates that Mongolia could produce 100 million tonnes of coal by 2020, but that would still be 1/30 of China's consumption (or less). Mongolia may be able to find other profitable countries to sell their coal to, but that may prove unnecessary. For the approximately 3 million people living in Mongolia, their rising coal production will be part of a palpable economic boom. However, for the roughly 1.3 billion people in China, the Mongolian addition to their coal needs will be "a drop in the bucket." To put this in perspective, Mongolia's population is approximately the size of Chicago. China's population is four times the population of the U.S. If the city of Chicago could suddenly produce 40 million tonnes of coal per year (or maybe one day 100 million tonnes of coal per year) to supply to one United States (never mind 4), that would be a boon to the local economy in Chicago. Moreover, Chicago's GDP is on the order of $500 billion with over $50,000 per capita GDP while Mongolia is still working toward a GDP of $15 billion and $5,000 per capita GDP by the end of 2012, making the effect of Mongolia's coal production on the local economy all the more significant. Author note: I maintain a blog with a weekly update of news from Mongolia. I have previously discussed the sovereign risk of investing in Mongolia in parts one and five of my five part series on investing in Mongolia based on my trip to Mongolia September 10 to 23, 2011. Disclosure: I am long Mongolia Growth Group (OTCPK:MNGGF) whose presentation I have cited in this article.